This interview is an extension of “Ian Green: Buddha’s Builder,” an interview with Ian Green from the July-September 2011 issue of Mandala located on page 46. Ian Green, a long-time student of both Lama Yeshe and Lama Zopa Rinpoche, has served FPMT and the Dharma only in big ways: as a founder and director of Atisha Centre in Bendigo, Australia, as the chairman of various FPMT-related boards, and as the director of two of FPMT’s biggest holy object projects: the Great Stupa of Universal Compassion (the largest stupa in the Western world) and the Jade Buddha for Universal Peace (the largest Buddha carved from gemstone quality jade in the world). Lama Yeshe asked for the Great Stupa and Lama Zopa Rinpoche for the Jade Buddha, making both projects not just impressive in scale, but contemporary examples of indefatigable guru devotion. How did you first meet the Dharma and the FPMT? Along with my wife Judy, I have been a Buddhist for over 35 years and a vegetarian for around 20 years. In a way, I owe meeting the Dharma to my career in advertising. Around 1970 I was living life in the fast lane, enjoying the samsaric delights of working in advertising and living the life that a good salary afforded a single guy in a big city. It was a time of long lunches, short affairs, high stake card games, fine wines and much excitement. Somehow I had enough wisdom to realize that despite the enjoyments of this life, if I did not do something, I would wind up leading a very short life. I decided to look around for other approaches to life and in 1971 I took six weeks leave from my work and traveled to India. As soon as I landed in India I saw that spirituality pervaded every part of Indian society and culture. Every shop, every car and every home had an altar. And every tree or rock seemed to be “holy.” All this made me realize just how materialistic our Western society is. But while I loved the “funky-ness” of the Hindu gods, I made no connection with them on a spiritual level. Standing in the center of the park, I was confronted by a great monolithic object. I could not work out if this was man-made or a natural phenomenon but it seemed to emanate an incredible power which nearly knocked me over. I was looking at the Great Stupa of Sarnath which marks the spot where the Buddha gave his first teaching. This park, which is known as Deer Park, is one of the holiest pilgrimage places of Buddhism. Within a few days of coming home I heard a radio interview with a Melbourne doctor who had been ordained by some Tibetan lamas in Nepal. The doctor (i.e., Nick Ribush) was giving a public lecture and so I went along to my first Dharma talk. Listening to Nick’s talk I had the same feeling as when I read the book on Buddhism: I knew it all but had never heard anyone say it before. Within a few days I became a student at Tara House (later, Tara Institute) in Miller Grove Kew (Melbourne) and within a few months I had received teachings from Nick Ribush, Geshe Loden, Zasep Tulku and Konchok Dronma. By the mid-1970s I had my first encounter with my holy gurus Lama Thubten Yeshe and Lama Zopa Rinpoche. In 1979 I completed the month-long course at Kopan Monastery in Kathmandu. Around this time I took up my first official FPMT role as chairman of the Tara House Executive Committee. What is the history of how the Bendigo Buddhist developments came about? The search for a retreat center for Tara House went on for months. Uldis Balodis, myself and one or two others drove all over the state trying to find somewhere suitable. I remember long drives up and down dirt roads looking for places that might be suitable and might be for sale. One weekend I came home to see my family in Bendigo and was speaking to my father, Ed Green, about the search for the retreat center. In the course of the conversation my father said, “Why don’t you use some of this land?” He had purchased over 700 acres of bushland in the Myers Flat area near Bendigo. I was never quite sure why my father bought the land. It was close to the area where he was bought up and perhaps he felt a connection with the land. In any case, Ed felt he could not go wrong with this purchase – there was so much land, so close to a growing regional city and at a very reasonable price. Later on my family set up a heritage park called Sandhurst Town on the land. In mid-1980 I wrote to Lama Yeshe to tell him of my father’s offer to donate 50 acres of land to set up a Buddhist center. Lama wrote back to say that he would ask a high lama for a divination on the suitability of the land. News of the divination came shortly and it was that a Buddhist center on the land would be of medium benefit. Not easily deterred, Lama Yeshe then approached two other high lamas for their divination. Their “second opinions” were very positive and indicated that the land would be highly beneficial. Lama then accepted Ed’s offer and agreed to teach on the Bendigo land when he next visited Australia in 1981. Now the real work had to begin. I had to find some people to shift to Bendigo with me to set up Atisha Centre. At the 1979 Kopan course I had met and befriended Ken Hawter, a physiotherapist from Perth. I asked Ken if he would come with me to Bendigo and he agreed. Ken soon set up a physio practice in Bendigo and became a part of the local community being, amongst other things, a very popular member of the Lockwood Tennis Club. Ken was later ordained and now lives at Chenrezig Institute under his ordained name of Ven. Pende. I also asked Judy Imer if she would come to Bendigo. Of course this was a very big decision for a mother of three small children. I think that Judy was both excited and frightened by the prospect of the move. But it was after she threw the I-Ching and received a very positive reading about the possibility of ever expanding results that Judy made her life-changing decision. And so it was that Ken, Judy, Finn, Zack, Cody and I moved to Bendigo in March 1981. At this time our accommodation was railway carriages with no electricity or running water. It was truly an amazing achievement for Judy to look after our three boys by kerosene lamp and water jugs while also helping to set up Atisha Centre. We only had six months to make Atisha Centre ready to hold a course with Lama Yeshe. He was booked to teach at Atisha Centre for four weeks in August 1981. Fortunately we were joined by some other hardy pioneers to help with the work. Some of the people who came to help were Ven. Harry Sutton, Alex and Stewart Moore, Graham Reid, Kevin Smith, Graham Mathews and our dear friend Alice Arbuthnott. There was so much to do. The five railway carriages all had to be painted and have beds and mattresses put in them. Toilets needed to be set up, septic tanks put in, kitchens set up and so much more. My father also contributed a great deal to the facilities when he arranged for his company, Stramit, to donate and erect the toilet block, kitchen, small gompa and adjoining accommodation block. These buildings have contributed to Atisha Centre for the last 30 years. In fact, in those six months, nearly as much building took place at Atisha Centre as happened in all the years since. We also arranged to “borrow” the church and restaurant from the family tourist attraction, Sandhurst Town, for the course. The course was held in the church and the retreaters ate their meals in the Sandhurst Town restaurant. Interestingly, the same restaurant building (now known as the Great Stupa Exhibition Centre) was used to feed the people attending Lama Zopa Rinpoche’s course in April 2011. Somehow we managed to put everything in place and by August 1981 Atisha Centre was ready to open its doors. Lama was accommodated in my mother’s house. And around 120 people came to attend the inaugural course at Atisha Centre which was on mahamudra. Lama also gave a Heruka initiation and held a public talk at the Kangaroo Flat High School hall. During his stay at Atisha Centre, Lama did a lot to help the center become established in the local community. He had a very convivial meeting with the Bendigo Anglican Bishop, met with the Council at Marong Shire and made several media appearances. After the course was over the retreaters all pitched in to help the community celebrate the birth of Buddhism in Bendigo with an open-day festival. This was held in Sandhurst Town. Entry was free and we had clowns, jugglers, stilt-walkers, food and rides. We estimate that over 5,000 people turned up on what was a very weather-threatened day. The open day was a great success and Lama loved it. In fact, Lama contributed greatly to the success of the open day. Early that morning Judy paid him a visit at his house. Lama asked, “Is there anything I can do to help?” Judy replied, almost as a joke “Well, Lama, you could fix the weather for us.” Lama smiled and said, “OK.” Later in the morning Lama was seen making offerings to the deities. And while black clouds continued to come low overhead for the whole day they were witnessed by many people to separate overhead and leave a hole of blue sky over the open day. There was not a drop of rain during the open day. During this course, on August 14, 1981, to be exact, Lama walked over land with Garrey Foulkes and myself and gave us his master plan for Atisha Centre, the monastery, an aged-care facility, a lay community and, of course, the Great Stupa of Universal Compassion. Lama spoke at length of his vision for the area to cater for Buddhists throughout their life. His “blueprint” was to set up a Dharma city. At the time I was aware that what Lama Yeshe had asked me to do was an enormous undertaking. I also considered it to be an opportunity to make my life particularly useful and meaningful. I considered myself, then and now, to be very fortunate. The original 50 acres (20 hectares) offered by my father was later added to with further land from my mother, Joyce and myself. In total the Green family has contributed around 150 acres (60 hectares) to set up the Buddhist projects in Bendigo. An official master plan has been prepared which lays out Lama Yeshe’s vision for this land. And today much of Lama’s vision has become a reality. After Lama left, Judy and I settled into continuing to set up Atisha Centre and for the next 15 years or so we were the directors of Atisha Centre. Our directorship was followed by many who have all made their contribution to fulfilling the vision of Lama Yeshe and Lama Zopa. Atisha Centre directors since Judy and I were John Wright, Carl Sillery, Ben Karmay, Yien Law and Cherry Rattue. The contribution of these directors and the members of Atisha Centre have continued the development of this important Dharma teaching and retreat community. Ven. Thubten Gyatso has been responsible for the creation of Thubten Shedrup Ling Monastery on the exact location specified by Lama Yeshe. Gyatso has provided much of the money and even the labor to build the monastery. In addition, Geshe Konchok Tsering, several monks and benefactors have contributed greatly to the establishment of Australia’s first Tibetan Buddhist monastery. Not much happened on the Great Stupa for the decade after Lama Yeshe’s visit as most of my attention was on making Atisha Centre viable. We did however ask two architects for their input on the Great Stupa. Several rather curious concepts were drawn up including some designs which incorporated aspects of Buddhist stupas and Australian outback homesteads. In 1994 Lama Zopa Rinpoche sent me a coffee table book of Tibet. Over a spread on the Great Stupa of Gyantse he had written: “This is my idea for the stupa in Bendigo.” In 1995, Garrey Foulkes, Peter Stripes, Tao Langham and I visited Tibet and took many measurements at Gyantse. In 1996 His Holiness the Dalia Lama gave the Great Stupa his blessing (and its name) and I stood down from the Atisha Centre directorship in order to focus on my life’s work of building the Great Stupa of Universal Compassion. I have continued in the role of chairman of the Great Stupa of Universal Compassion, Ltd. until the present day. In what capacities have you served FPMT over your life? How has your contribution been recognized? Why have you chosen to serve FPMT and Rinpoche in this way? The short answer is that it is my feeble attempt at guru devotion. My studies and baby- meditations on the lam-rim were enough for me to develop a degree of renunciation and faith in the Buddhadharma. Then after having the opportunity to witness first-hand the way the lam-rim was put into practice by Lama Yeshe and Lama Zopa, my devotion to these gurus arose naturally. So when the opportunity to create a Buddhist center, to build a Great Stupa and later on to carve the Jade Buddha came along, I felt fortunate to be able to fulfill the gurus’ holy wishes. A good example of how this works in practice is the creation of the Jade Buddha. Shortly after I had seen the massive jade boulder “Polar Pride” in Canada, I explained to Rinpoche what a unique gemstone it was. The next morning I received a message that Rinpoche had foreseen that Polar Pride would become a Buddha that would “illuminate the world.” Rinpoche then told me, “You must turn this giant gemstone into a holy object as an offering to the world.” With some small degree of devotion to the guru in my heart my response was not to ask “why” but instead to just start thinking about “how.” In the case of the Jade Buddha, the big “how” was: “How do we raise a million dollars to buy Polar Pride?” It took nearly two years to negotiate a deal where we could purchase Polar Pride interest-free over a five-year period. Then, almost miraculously after much writing and rewriting of contracts, we were the owners of Polar Pride for a very modest down payment of USD$250,000. I am sure that such an audacious plan could not be executed without faith in the guru. Why do you believe that holy objects like the Great Stupa and Jade Buddha are important? I believe that by creating significant holy objects in the Western world we are shaping the reality of sentient beings. Our view of what is important and indeed what is real is heavily influenced by the physical world we see around us. For most of us the world we see is our urban environment which is dominated by symbols of commerce (office blocks), shopping (shopping malls), sport (arenas) and individuality (suburban housing). We interpret this information to mean that these are the important values of our society. Symbols of the spiritual component of our life are very minor by comparison. And the symbols of religion and the spiritual that do exist in our culture seem to belong to a distant time that many of us find hard to relate to. The Great Stupa and the Jade Buddha are becoming international symbols of the importance of spirituality and peace in our lives today. By making large holy objects a part of our landscape, we are creating a new reality. This is a reality that presents spirituality as a vital part of being a human being. Did you already have the skills necessary to serve in this way, or did you develop the skills through the service itself? I do not think anyone has all the skills to do one of the big jobs within FPMT. I graduated with a Bachelor of Arts in English and Philosophy, and I had a career in advertising. While useful, this education and career left big holes in my FPMT skills list. Some of the knowledge I have acquired during my time working for the Lamas includes a working knowledge of architecture, landscape architecture, Buddhist protocols in Tibet, Vietnam and China, structural engineering, gardening, handling of holy relics, preparing and caring for holy objects, fundraising, feng shui, funerals and memorials, sculpture, sewage treatment plants, town planning, wills and estates, and water irrigation systems. I know a little bit about all these things but I am far from an expert in any of them. However, I do not want to deter the others who are embarking on big Dharma projects for Lama Zopa. I think it is important not to be daunted by every skill you have to acquire. And don’t be afraid to ask questions. Generally, most professionals have quite a lot of patience when it comes to well meaning amateurs. It is also important not to be scared about making mistakes (as long as they are not costly ones). Sometimes you just have to try something to see if it works. And if it does not work, then you try something else. This is exactly what we did with finding the finance for the big jade boulder. Once we had paid the first installment on the jade boulder “Polar Pride” we were faced with the reality of financing the Jade Buddha over the next five years. We needed a steady income stream to complete the payments on Polar Pride, as well as for the transport, insurance and the carving. In fact, we tried many different ideas and most of them failed. One spectacular failure was when I tried to interest people in “investing” in the Jade Buddha by promising them a financial reward once the Buddha was carved. This idea was soundly rejected because most people, quite correctly, did not want to mix business and Buddhism. We also tried to borrow funds with very limited success. I approached two wealthy businessmen; one in Bendigo and one in Melbourne to seek their support. But neither man was willing to offer any funds and hardly any advice. We then tried pre-selling jade statues. But still the money was coming in very slowly. Judy and I tried as much as we could to raise funds from our savings and from our supporters, but generally our income was small compared with the regular payments on Polar Pride due at the end of each year and the costs due to the carvers. But in the end we found our finance through a combination of methods which have all contributed to the Jade Buddha for Universal Peace being completed and completely paid for. When you are appointed the director of an FPMT project you have to become a leader – whether you think you are suitable for that role or not. A leader must inspire confidence in others that the project will happen and that it is in good hands. This does not mean that you have to be a charismatic person. Whatever your personality, you simply be the best that you can. No one can ask more of you than that. One very handy skill for a leader is learning who you can trust. When you are in a senior position with a large Buddhist project many people come to you with all sorts of suggestions, proposals and money making schemes. In the early days lots of people had lots of ideas about the Great Stupa that they were passionate about. These ideas ranged from the style to artwork, the type of concrete to the types of vegetation that “must” be used. As the Stupa and Jade Buddha projects have become more widely known around the world, there has been a surge of interest from people with input and ideas. You learn to be astute about those who are simply trying to take advantage or make money out of the holy objects. Even though my experience has shown that at least 90% of these ideas are completely wild, I make a determined effort to keep an open mind and give everyone a fair hearing. I think it is hard to give advice on working out who you can trust. As you have more experiences in life, it is a skill you acquire. I have found the teachings on selecting a guru can be useful; checking up what they say, who they associate with and the results of their activities. I have also found that Green Tara has been a very reliable guide. How did you start working on both the Great Stupa of Universal Compassion and the Jade Buddha? You know the story of how you climb a mountain? You spend quite a while looking at the top and thinking about how you might get there. Then you transfer your gaze to your feet to make sure you have a secure foothold. It is a bit like that. Rinpoche has commented that the way the Great Stupa has been built is a good example for other major projects to follow. He described our careful, steady progress as being like an aircraft on a runway which takes quite a while to get to maximum speed before taking off and soaring to great heights. He said, and I agree totally with him, that the biggest danger is to leap into things before you are prepared. These leaps can lead to crashes which can set major projects back for a very long time. Unfortunately, first impressions really do last a very long time. I have been very conscious with the Great Stupa and Jade Buddha that we maintain the faith with our supporters. We have done this by acting with integrity, keeping supporters informed, not over-promising and maintaining a momentum so that we are always seen to be moving ahead. Any Dharma project which is financed by donations relies on integrity. The way you spend money must be seen to be effective and prudent. And above all, the key people on the Dharma project must be seen as excellent agents who are acting with good intentions and integrity. There is an old maxim of fundraising which says that people give to people just as much as they give to causes. I believe this maxim applies to fundraising for Dharma projects too. The way you act to others, the money you spend on yourself, the regard you show for your personal comfort will all be scrutinized and judged. When you represent a Dharma project you take on the responsibility of upholding the reputation of the Dharma project and in some cases even of Buddhism itself. Keeping people informed is relatively straightforward but it does require a commitment to see this as a priority. Whereas not over-promising is something I have found difficult. The problem is that you want to keep people enthused about the project and the first question everyone asks is, “When will it be finished?” so you feel a pressure to respond with dates and timelines. In reality dates are very difficult to estimate when your income primarily relies on the generosity of others. Thankfully, Buddhists tend to be forgiving and generally they have chosen to ignore some of my earlier statements about ambitious deadlines. Maintaining momentum has involved looking for something new to show people if they came back each year. This has meant on some occasions we have chosen the phase that was going to make the biggest impression instead of what was the conventional next step. To put it simply, steel in the air looks a lot more impressive than pipes in the ground. Of course, we would never have done this if it wasted money. Did you think you were ready to handle such immense projects from the outset? I was sure that I was not ready to handle such immense projects. I sometimes think that getting a big project from Lama or Rinpoche is like being given two bricks and being asked to build a skyscraper. Not having built a skyscraper before, you have no real idea of where to start and what is required to make these projects happen. But you do know that no one else is any better prepared than you and there must be a reason why you were chosen, and if you do not make it happen, no one else is likely to. There is also the issue of what you are willing to sacrifice. To make a major Dharma project happen in the West you need to be a little obsessive and this means being willing to give up some of the normal things that we do with our time. Life goes by so quickly and there is only so much time in a day. So the only way to keep these projects moving is to cut some things out of your life. There is no doubt that I have had to make sacrifices to my family life, my career, my leisure and my spiritual practice to be able to have the time and energy to drive the Great Stupa and Jade Buddha projects. This cost has been shared by those who are closest to me, especially my wife Judy. But I have no regrets. In fact, I feel blessed to have been given the opportunity of making my life meaningful. As I said before, life is short and unless you focus your energy; time can easily slip through your fingers with little to show for your precious human rebirth. What are the biggest challenges facing these projects? What have been your biggest successes to date? Perhaps the most important teaching I received from Rinpoche in regard to creating holy objects was: “The greater the merit … the greater the obstacles.” This teaching not only made me ready to accept obstacles when they arose before me, it made me expect them and even, in some (rare) cases, to welcome them. Of course, the biggest challenge has been how do you raise the vast amounts of money required to build the Great Stupa (AUS$20 million) and create the Jade Buddha (around AUS$2 million)? Sometimes it takes an ultimatum to steel your resolve. And when it comes from your holy guru you just say to yourself, “OK, there must be a way. We will do it.” I am very grateful for the support of Great Stupa board members and especially Wayne Thomson, Tom Castles and Salim Lee at this time. Gradually, a few people in Singapore and in Australia had the courage to commit their funds to the project and we started to pre-sell some Buddhas from the off-cuts of Polar Pride. And so a confidence grew that yes we can make the Jade Buddha a reality. How do you maintain your energy, devotion and mental health when you work on such large-scale projects that presumably require constant attention? Do you have any advice or suggestions for FPMT students that want to complete large-scale or other extensive projects? When you work on BIG projects such as Maitreya Project or the Great Stupa you must remind yourself that you are running a marathon – not a sprint. There have been too many sad examples of devoted students who have burnt themselves out by trying too hard to fulfill the guru’s holy wishes. Realizing we are on a marathon means that we realize we cannot work at full speed all the time, that we need to hold something in reserve, we have to be patient and wait for the right time to put in maximum effort. You need to honestly know your limits and the reality of your situation. If you are likely to get stressed out (and who isn’t?) then you need to monitor your stress levels to make sure they are within your limits. If you have family commitments or a demanding job, you need to be realistic about when and what you can do. Of course a little stress is inevitable and in fact it is even desirable as a spur to action. I guess we all know some people with good Dharma hearts who seem to love talking about Dharma but are not so keen on putting words into action. Perhaps a little bit of stress might be the motivation they need? For me, death meditation which makes me realize that death will happen and it can happen at any time is a great way of keeping a little positive stress in my life. Looking back at our life from our death bed it will seem to have gone very quickly and it is the last place you want to be alone with regrets of what might have been. At the same time, as the Buddha so kindly pointed out, our way through life should be on the middle path. So we also need to be able to relax and to be kind to ourselves and those dear ones we share the life with. What are some of your visions or goals for the future of the Great Stupa and Jade Buddha? The goals of our Lamas’ are only BIG – and so should our goals be. The Jade Buddha is a phenomena which Lama Zopa has predicted will “[i]lluminate the world.” My goal is that the Jade Buddha will inspire billions of beings in this universe to follow the peaceful path. And that it will leave a legacy of lasting peace wherever it tours in the world. My goal for the Great Stupa is for it to inspire countless beings throughout the universes (all those who see it and even those who hear about it or dream about it) to follow the spiritual, compassionate and peaceful path, and that it liberate tens of thousands of beings every day. What is the detailed vision for the Great Stupa? As mentioned before, it is our aim to change the reality of beings by seeing the spiritual dimension as of utmost importance. While this overall goal is spiritual, my intention is that the experience of coming to the Great Stupa will be as easy, comfortable and pleasurable as possible. These days, people are used to the convenience of shopping malls and we have to be able to “compete” with this. The services people expect are parking that is nearby, convenient and clean toilets, air-conditioning and being indoors and sheltered from the elements as much as possible. In addition, we will provide some form of buggy transport for infirm visitors. 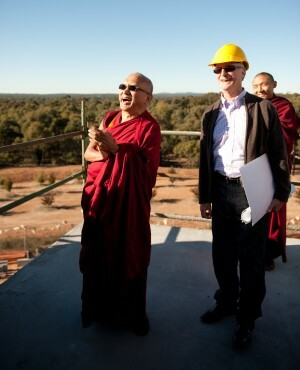 And lifts inside the Great Stupa will provide wheelchair access to the Bumpa level. Given the message of His Holiness that we should do what we can to minimize the impact on the environment, we need to plan to be an example of minimal energy usage in the Great Stupa and to maximize our own electricity generation. We believe that some form of heating and cooling is required in all or at least most levels in the Great Stupa. However, this does not mean, for example, that we would maintain 22 degrees Celsius (72 degrees Fahrenheit) throughout the building. Water will be collected from the terraces and used for watering the garden. Water will also be collected from the roof of the Bumpa and piped to a separate point for bottling. The Great Stupa will be presented as a monument of world standing. This monumental aspect enhances the feeling of “significance” in the visitors mind and it should be reflected in many ways including that the entrance road should rise up to the main carpark to help create a sense of expectation. From the carpark the visitor will proceed to a visitor reception center where the experience will be shaped by an introduction to what is about to come. This will include an overview of Buddhism, stupas and so on. Psychologically this building will also prepare the mind of the visitor for the transition from the mundane to the spiritual. The landscaping of the Great Stupa then plays an important role in the inspirational experience of visiting the Great Stupa. The entrance to the Great Stupa will follow the natural descent down to a saddle. Along this path will be the “Garden of Samsara” which will feature statues of the suffering realms of existence. At the bottom of the descent the visitor will enter a bodhi tree grove which features Buddha statues amongst the “Forest of the Buddhas.” This will be a beautiful area for families to have picnics and relax in the shade. It also represents meeting with Buddha and taking refuge in the Buddha. From this point one rises up to the Great Stupa and symbolically to one’s own enlightenment. Natural sandstones will be used in garden edging to reflect the colorful sandstone and siltstone which is endemic to the area. Herbs with health benefits will also be used in the landscaping. Both lavender and rosemary will be featured in mass plantings. The essential oils from these herbs will be extracted. Trees around the Great Stupa have been chosen for their beauty and the comfort they provide to people. Trees around the circumambulation paths are deciduous and very suitable to this region: Chinese Elms, Manchurian Pears and Crepe Myrtle. The Great Stupa is surrounded by three circumambulation paths which run for a total of 1 kilometer (0.6 miles). Short walks would also be laid out in the bodhi tree grove area. And it is possible that we will have a long kora which provides circumambulation around the Great Stupa, Atisha Centre and Thubten Shedrup Ling Monastery. Visitor reception center/museum: this building will provide a transition from the mundane to the spiritual. Included in this building will be toilets, souvenir and snack shop, an induction area which may include audio visual presentations. This building will also house a museum which will present the history of the Great Stupa, Atisha Centre, Thubten Shedrup Ling Monastery and the Jade Buddha for Universal Peace. The restaurant and convenience store will service the visitors as well as residents in the nearby village and hotel guests. The hotel will be on the same level as the carpark but located in such a way that guests can have a relatively private and quiet time. Please visit The Great Stupa of Universal Compassion and The Jade Buddha of Universal Peace to learn more about these projects and what you can do to help them become a reality.